My sister Susan is an excellent cook and her garden is a thing of culinary beauty. I’m not a bad cook either, if I say so myself. This is a gift from our family. While we were both raised in the fifties and sixties, the dark ages of American cooking, we were lucky as, for us, food was something tied to family and celebration. Our mother lovingly prepared our meals and dad manned the grill in summers. We always sat down as a family for a dinner that did not include a television set. Our parents also loved to entertain, so adults gathering around food and cocktails (wine had not yet been discovered in Harvard Illinois) made good food and good times synonymous for us. Then there was our grandmother, my mother’s mother Goldie, who was simply one of the greatest cooks I have ever experienced. Her repertoire was formidable, but it was only in one genre - classic midwestern farm cooking. This was a hybrid of English and German cooking that had been transformed into the cuisine of the American prairie. Portions were substantial, as this was fuel for families spending their days doing the hard physical work that was life on a small dairy farm. Her Christmas dinner was a tour de force: roast turkey, roast beef, ham, oyster stuffing, mashed potatoes drenched in butter and seemingly countless other side dishes. A table bent under the weight of pies and cakes. Almost thirty of us would gather at one long table and eat until we could eat no more. But eat more we would as the pièce-de-résistance would be unveiled - the suet pudding. She would only make this pudding once a year at Christmas. It was sublime. It was also the single richest dish I have ever eaten in my life. Special note must be made of my grandmother’s pies. Thank goodness these were the days before cholesterol and Crisco. Goldie made her pie crusts with lard and the fillings from what grew on the farm - apple, rhubarb, cherry. If you have never tasted a pie crust made from lard, you have not tasted a real pie. The memories of these pies (rhubarb was my favorite) makes my mouth water to this day. Growing up I never wanted a birthday cake, I wanted a birthday pie. Such positive memories of food in your youth cannot help but lead you into the kitchen yourself. When I started to get seriously interested in cooking, I was lucky to have some very special teachers. There was Julia Child, James Beard, Richard Olney, M.F.K. Fisher and Marcella Hazan at my side in my kitchen as I taught myself to cook. Their cookbooks were stained and abused as I tried to follow the recipes. Indeed my first copy of Mastering the Art of French Cooking was severely singed on the back cover due to a brush with a hot stovetop. To me, the wear and tear on these books was a badge of honor. I inhaled these books like a mystery fan reads Sherlock Holmes. This was learning to cook in the 1970s. Food had been born again in the United States led by these now venerable cooking and food writers. My entire life and career was influenced by these writers and they led me down the path to my love of wine and my, now over thirty-five years, career as a fine wine professional. Due to them, for me food and wine has always been the same topic and it is this philosophy that guides my winemaking goals to this day. I was filled with these memories and feelings as I read a book that has to be profoundly moving to anyone who experienced the rebirth of American cooking . Provence 1970 by Luke Barr chronicles the experiences of M.F.K. Fisher (his great aunt), Julia and Paul Child, James Beard and Richard Olney as their love of France and French cuisine transformed American cooking and eating and then, eventually transformed them as they went beyond the limits of French cooking and help create a uniquely American food and wine culture. Provence 1970 is one of those books that brings you a touch of sadness when you reach the last paragraphs as you become so personally involved in the world the book recreates as your own memories weave together with the events and experiences so vividly and thoughtfully recounted by Barr in this lovingly written book. As you read the last words you know that the world the author has created is one you do not wish to leave. Perhaps you have to be of a certain age to feel the emotional tug that this book had for me. The food culture in the United States no longer takes a back seat to those of Europe. American restaurants are on the cutting edge of fine dining, leading the way, not following, to the next big thing. That American wines are as good as any made anywhere is old news, not even considered by younger wine buyers. Fabulous natural cheeses, charcuterie and excellent espresso are easy to find throughout the country. Farm-to-table restaurants and farmers markets with gorgeous organic, even biodynamic, produce are commonplace coast-to-coast. When I first started visiting Europe in the seventies I would smuggle cheeses, prosciutto and salami back hidden in my suitcase because such things did not exist at home. Today’s travelers don’t need to bother except for sentimental reasons as, not only can you find those things here, but often find better products made by artisan producers in their own home towns. The food culture in America has been totally transformed in just fifty years. 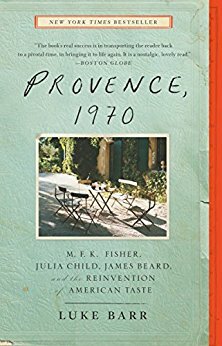 Provence 1970 recounts the beginnings of this change, but also tells the story, not only of my introduction to good food and wine, but the story of many, many thousands of American cooks, both home and professional. The American cooks, that learned to cook from the likes of Child, Beard and Hazan together changed the world of American food and wine. It was a circuitous route we took to return to the locavore, organic cooking of my grandmother. We had to pass through the rigid rigors of haute cuisine and a Francophilia driven by our culinary insecurities to get back were we started from - local food, simply and well prepared. Which, come to think of it, also are my favorite dishes in France and Italy. Christmas dinner will be here soon. As I plan the menu, my grandmother will be there with me. I hope to make her proud as the flavors of her table live in me and are a part of who I am. I can taste the suet pudding now.